The Canary Islands Custom Scenery project is an ambitious project of pilots, developers and supporters of the Canary Islands region. Its aim is to provide the region in a scenery quality as high and as detailed as possible. Other branches of this project take care about a more realistic local AI traffic, multiplayer events and local airlines. The project is currently under development, with an increasing number of contributors and steady updated contents. 3 Why fly to the Canary Islands? The Canary Islands are an archipelago in the east Atlantic, off the coast of Morocco. While geographically belonging to Africa, their political status is that of an autonomous region of Spain. Being called the "Islands of eternal spring", their climate is mostly warm, with an average temperature of 25°C. This makes all seven Islands perfect for tourism, so that this is the region's main income. Because of this very high tourist level, there are airports on all islands. 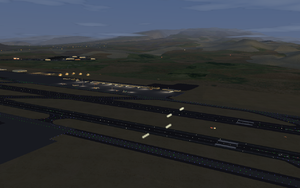 Except for the airport of El Hierro (GCHI), every island has an international airport. The weather is excellent for flying nearly all the time, some winds could make it a challenge, especially in smaller planes. Aside from general air traffic, there are many touristic flights from central Europe, mostly from the Uk and Germany. Connections to the spanish mainland are provided by Vueling and Iberia. Very interesting is the regional carrier sector, operated by the Canarian regional airline Binter Canarias. Why fly to the Canary Islands? Having eight regional and international airports in such a small region is a very big advantage. This makes it very easy for pilots to improve their skills, especially takeoffs, approaches and landings. The nicely-modeled scenery is worth a special look, so you really can enjoy your flight. A whole lot of people had visited the Islands for their holiday, so now you are able to really get that holiday feeling, when touching down at one of the nicely modeled airports. The airports themselves are very different in style, conception, use and their level of difficulty. From the international airport of Las Palmas de Gran Canaria, where you can easily perform a landing with a 747 or A380 to the small one of El Hierro, where it can be difficult to have a touch down even with small regional turboprops, or the notorious Tenerife Norte - Los Rodeos, there are sites for every kind of aviator. This custom scenery is currently under development. We are still working on the project, making it better and more realistic. It's not planned to publish it via TerraSync by now, maybe we are going to do that later. Actual and updated versions are accessible via https://github.com/D-ECHO/Canarys. A custom scenary zip can ben downloaded here. The whole region is re-textured according to the actual vegetation and look. This avoids double processing, and gives us a notice what we can expect in the near term. This page was last modified on 5 July 2017, at 10:07.